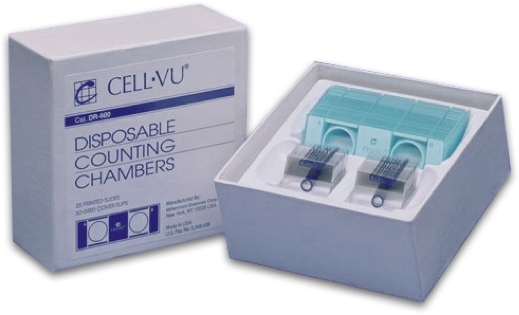 Isolate and view the CELL-VU® grid. This grid is divided into 100 small boxes each 0.1 x 0.1 mm.For undiluted sperm count all motile and non-motile sperm within 10 small boxes of this grid. Divide this number by 2. This result is the concentration of sperm in millions/ml. For specimens with low sperm counts, count all sperm within the entire central square (100 boxes). Multiply the count by 50,000 to obtain the total concentration of sperm/ml.